If you contact the vendors, I'd appreciate it if you told them you found them via the Carting with Your Dog web site. Thanks! Recent discussions on the Carting-L list have centred on boots for dogs to wear while participating in activities such as carting. A new section has been added that lists some companies recommended on the Carting-L list. As before, a listing here is not an endorsement of the product, but is intended to be a focus point for information. 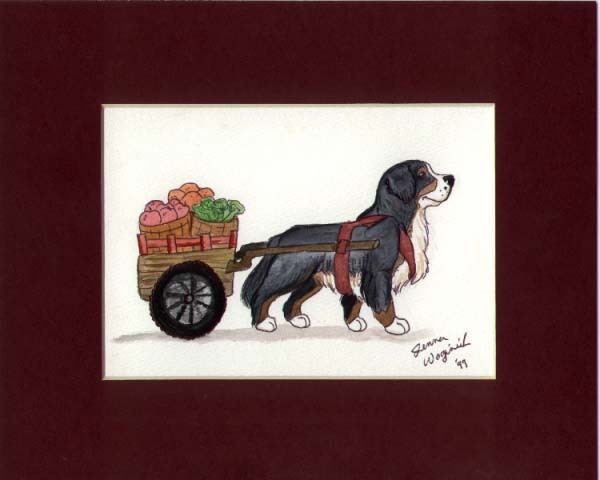 Handpainted carting dog watercolors - matted and framed for you. Your breed carting. Pick the load (i.e fruit, milkjugs, puppies.....) and any special touches (spot over eye, or black mask etc) See web site for samples and pricing information. Click on pictures for larger images. Their Dog & Cat Book Catalog lists a section on carting. No idea if the items listed are any good. We sell equipment for Dog-Powered Sports and are the exclusive North American Distributor for the Sacco Cart. We will soon have a discussion forum on our site as well. We are a good source for Dog-Powered Sport enthusiasts. Good carting video, plus lots of equipment and knowledge. Dog scootering is team work. The dog runs and pulls the scooter. The human stands on the scooter and scoots with her free foot. In Australia and Europe dog scooter teams race each other. In the U.S. dog scootering is still a new sport. The carts have been used by many in competition as well as over all utility. Light weight and customizable. Has an interesting picture of a "sulky" type cart being pulled by a German Shepherd Dog. Many different types of carts available. Custom made leather carting harness, carting leashes, shoulder packs and dog carts. Located one hour northeast of Toronto. Whether your interests involve competitive sports such as weight-pulling, sledding, lure coursing, schutzhund, hunting trials, etc. or recreational sports such as backpacking, bicycling, or jogging, we have products which will assist you in your goal. Custom carts. Al made the cart that is pictured on the main page on this site. Established since 1982, K-9 Sulkys have been the cart of choice for those that want to enjoy the great outdoors and have fun with their dog! The K-9 Sulky was developed and designed with the comfort and safety of your dog in mind. Lots of photos at this site! Miniature Wagons makes a Parade Cart and a Training Cart from wood. You can get custom versions built. The Moriah Company offers the finest in handmade leather canine goods. Included in our product list is a full line of leather leads and harnesses, including carting harnesses. 456 Mt. Hermon Station Rd. They carry books, harnesses, travois, pulks, couplers, drag bars, booties and sponsor workshops for the draft dog enthusiast. Makers of the traditional Newfoundland-style cart harness shown on the Pyr on the main page. They also offer a two-wheeled cart. Ask for their catalogue. The web site features pictures of their custom-built carts and dogs, prices, and contact information. The web site features an online catalog, including pictures of carts, prices, and the names of dealers world-wide. 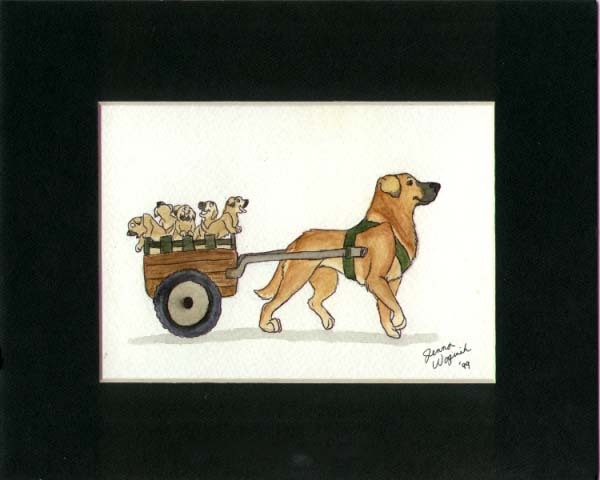 The web site features an online catalog, featuring several different wagons that can be converted to dog-powered vehicles. We carry the Sacco Cart from Norway for carting. An ideal cart for both miniature horses and medium to large dogs, the Regal Mini weighs a mere 39 pounds (17.8 Kg) and yet includes fully independent suspension by Koni Special 'D' adjustable shock absorbers. The combination of light weight, high strength and independent suspension gives an easy draft to the animal and a smooth ride to the driver. Manufacturer of the Sacco Dog Cart (in Norway). SierraKennels specializes in building wheeled carts for training your dogs during the off season or when there is no snow. Wagons, carts, harnesses and an interesting looking Starter Kit. This section lists some companies recommended in discussions on the Carting-L list regarding boots for dogs involved in physical activity. Dog Scootering involves your dog pulling you as you ride a scooter. No shafts involved, but apparently a lot of fun. The is an email list dedicated to this activity called DogsLovetoRun. You can sign up at yahoogroups.com. Scootersport is the official Canadian distributor for Jones Sports Scooters. These extreme downhill scooters are bullet-proof, tough and the superior design makes them the ideal dog scooter. The companies listed here make products that may be of interest to those involved with draft work, etc. Welcome to laughing-dog.com - There's something for everyone who loves dogs - from the person who's dog's only job is to keep the couch warm to the person who is a serious obedience, schutzhund, or conformation competitor. Love Newfs is proud to offer you this fabulous first-to-market innovation... the TWISTEP™... definitely a "must have"! The clear advantage of TWISTEP™ over ramps is ease of use – it takes just one hand to twist to use in seconds! No lifting, storing, or setting up required. The TWISTEP™ is an innovative new product designed to provide easy access in and out of SUV’s... No more lifting your Newf. Note that inclusion in this list does NOT represent an endorsement of the company or its products in any way. This list is provided strictly as a service. Comments and suggestions can be sent to warrickw@cartingwithyourdog.com. Portions copyright by original authors and photographers. This page and content may not be reproduced without permission from Warrick Wilson.